Each year since the early days of the American automobile, the folks at Motor Trend have been awarding their Car of the Year award and the all new 2014 Cadillac CTS has been named the top car by MT for the second time. The Cadillac CTS also took Motor Trend Car of the Year honors back in 2008 when the second generation of the plush midsized luxury sedan was introduced. To win the 2014 Motor Trend Car of the Year award, the new Cadillac CTS had to beat out some stiff competition including the new BMW 4 Series, the Jaguar F-Type, the Kia Forte, the Mazda3, the Mazda6, the new Mercedes Benz S-Class and the Chevrolet Corvette Stingray. All of these cars were evaluated by the Motor Trend staff across six categories – Design Advancement, Engineering Excellence, Efficiency, Safety, Value and Performance of Intended Function. After ten days of intensive testing, the Motor Trend staff gave the nod to the newest CTS as their favorite car in America for the 2014 model year. “The all-new 2014 Cadillac CTS prevailed over one of the most competitive fields in recent memory because it best met our award’s key criteria. Our judges were particularly impressed by the CTS’s responsive powertrains and masterful balance of smooth ride and sporty handling,” said Motor Trend editor-in-chief Ed Loh. With the introduction of the smaller Cadillac ATS, General Motors’ designers looked to make the 2014 CTS slightly larger and far more upscale to better compete with the likes of the BMW 5 Series. While the bold, high tech exterior styling and super luxurious interior layout make the new CTS one of the most impressive luxury cars sold in America today, the CTS is also one of the most powerful options in the midsized luxury sedan options. The base engine is a 272 horsepower turbo 4 followed by a 321 horsepower naturally aspirated 3.6L V6 with both of these engines coming with either rear wheel drive or all wheel drive. Those 2014 CTS buyers who want more power – and lots of it – can opt for the new twin turbocharged 3.6L V6 that delivers 420 horsepower to the rear wheels in the new CTS Vsport sedan. The new CTS is also the first Cadillac to offer an 8-speed automatic transmission and best of all, the 2014 CTS does all of this with a price that starts at just $46,025. That price makes it one of the most affordable midsized luxury sedans in the American market while the 30 miles per gallon offered by the base turbo 4 makes the new CTS among the most efficient non-hybrid models in the class. This is the 5th time that Cadillac has been honored with the Motor Trend Car of the Year award. The Cadillac brand was first named “Car of the Year” by Motor Trend back in 1949 and again in 1952. There was then a long break before the Cadillac name came back into the Motor Trend spotlight with the Seville Touring Sedan ending that drought in 1992. As mentioned above, the 4th win came in 2008 with the CTS and the 2014 CTS makes a nice round number of five wins. 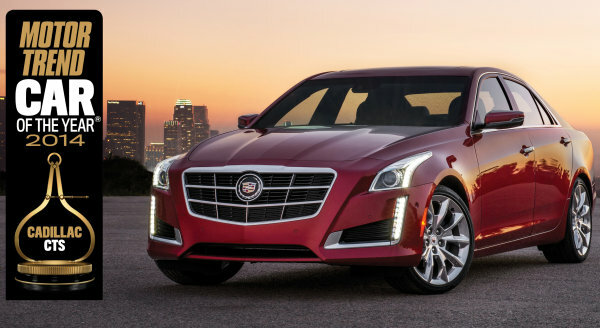 Congratulations to General Motors and the Cadillac brand for their 2014 CTS winning the 2014 Motor Trend Car of the Year!